"So Close To The Fish, You Can Smell Them!" Recent Article about John Milner. 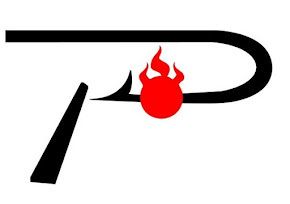 We Carry All "Team Pautzke" Products! Call the Erie Outfitters fishing hotline to get the latest fishing report and bait status. Happy New Year! With rivers high and the lake rock'in it might be a day or 2 before it really gets good. Enjoy the Holiday. With high water this week ,we should see even more fish push up are rivers. Western streams seem to have more fish spread threw out they're systems than the far Eastern tribs. There are no lack of big fish around this season with solid 10s and larger being common. With high off color water spawn ,big jigs as well as large flies are working best. The guys making the adjustments for high water are reporting the best fishing we have seen in years.With mild temps the next few days ,the bite should stay very good. Night walleye is still going strong with reports coming in from Huron, Vermilion and Cleveland all reporting good fishing. The best baits have remained the same all year. Husky Jerks are the best bet from shore with F-18s being the bait of choice for boaters. With rivers dropping steelhead fishing is firing back up. Fish are evenly spread threw out are rivers with new arrivals showing up every day. Walleye fishing is still going strong ,with mild temps and favorable winds its shown no sign of slowing down. 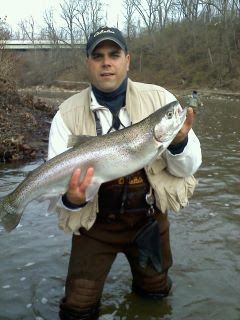 Mike Petruska with a 14# 2ounce giant caught in Cleveland a few nights back. Walleye night bite is still going strong. With rivers being unfishable the next few days this is a great option for guys to get out. Husky Jerks and F-18s in clown, perch or fire tiger have all been taking fish. 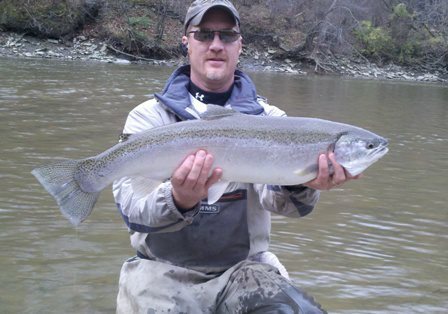 Rivers are on the drop, and should fish this week-end. Reports of big fish are coming East to West. Fish are evenly spread threw out all of are rivers and creeks. Spawn, jigs as well as flys are all taking fish. In the photo to the right ,Captain Dan Haude of Erie Adventures Sport Fishing shows off a real monster. Rain is falling and rivers are on the rise. They should be left unfishable the next few days. The days leading up to the rain were very good. Large numbers of fish have spread threw out the system. Spawn remains best bet with jigs and streamers also working. This has been a great year for big fish ,with a large number of teeners caught! 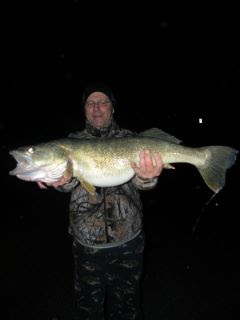 Night walleye is still going strong ,with large fish being caught. Husky Jerks and F18s in perch color have been good the past week. Night bite walleye , still going strong! Trolling the shoreline with F-18s is still top bet. Husky Jerks in clown and blue chrome thrown for piers from Huron to Cleveland are also catching lots of big walleyes. Steelheading is at its best so far this season. High water has evenly spread fish out all are river systems. Spawn ,minnows ,jigs ,as well as many fly patterns are all working. Locally bead fishing is catching on fast. 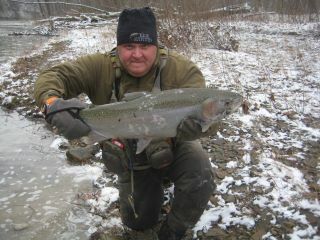 Trick'em beads in Steelhead Snot 10mm was my hot ticket ,Tuesday on Vermilion. Dime bright chromers found them irresistible. Happy Holidays! 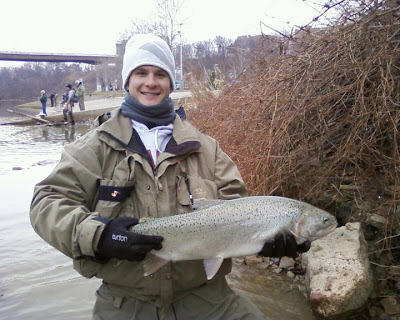 Don't forget Erie Outfitters Gift Certificates make a great stocking stuffer. Night bite walleye is happening all along the shoreline. Huskys, F18s are best bet. Reports from Huron to Cleveland ,from shore and boat are coming in with great reports. 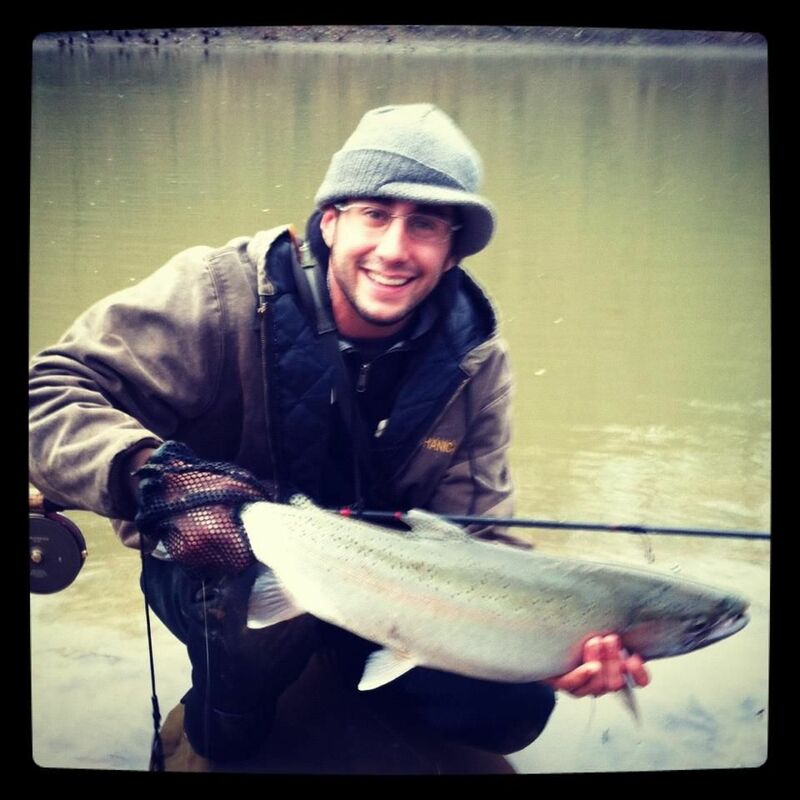 Steelhead fishing is really getting going with reports of plenty of fish. Spawn has been good with a strong jig bite as well. Fish are spaced threw out the system. High water has let the travel easily to upper sections of all are tributary's. Looks like with seasonally warm temps freeze up is still weeks away. Wade safe and keep the photos coming! This years Fall Brawl Winner "Issac" with a 13pound 11oz beast. Caught with less than 24hours left in derby. Great Job! That's a easy 1500$ in his pocket. Night walleye is showing no signs of slowing down. Huskys and F18s still remaining the hot bait. 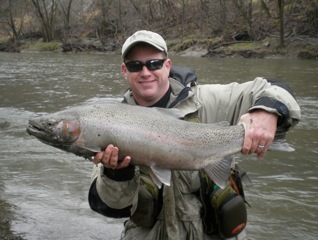 Steelhead fishing is gonna be on hold the next few days with high water and continued rain. 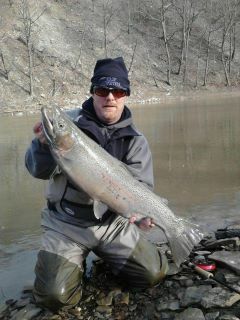 Steelhead fishing is in full swing. High water has brought in fresh runs to all are rivers. Spawn , jigs as well as many fly patterns are working. Watch flow rates over the next few days as more rain is coming. Night walleye fishing is as good as it gets at this time of year. F-18s and Husky Jerks are still the best bet. The Holidays are a great time for Erie Outfitter Gift Certificates.